The holidays are here which means it’s gift giving season! I’ve gathered up a variety of gift ideas for kids of all ages- from newborns to tweens! Bookmark this post because I’ll be sharing more great gift ideas as I discover them! Bobbi-Toads is a line of stylish kid’s footwear that would be a perfect gift for those that do the four gift rule (something to read, something to wear, something they want, and something they need). They have a line of paintable shoes and a line of light-up shoes. I love the bright colors, fun designs, and sparkles! See all the designs here. Magna-Tiles® are magnetic building sets providing safe, imaginative play that makes math and science fun and engaging for children of all ages. They’ve been around for years (when I taught preschool they were the most popular toy in the classroom!!) but now they have 6 brand new sets out including Magna-Qubix™ with 3D cubes, prisms, and pyramids, and Magna-Tiles Freestyle with the patented “X” shape and free-moving magnets. These books are full of fascinating facts and full-color photographs that make learniing fun! Each set also contains hands-on toys that go with the theme. The Space set comes with a sticker sheet, space figurines to play with, and the glow-in-the-dark stars. The Human Body set comes with a plastic model skeleton and 25 fact cards. The World Atlas comes with an inflatable globe and cardstock models of some of the wonders of the world. Cuddle+Kind dolls are beautiful, soft, and cuddly dolls, ethically produced in Peru. They are lovingly hand-knit, hand-loomed, embroidered and crocheted by artisans using knitting expertise that has been handed down for generations making them heirloom quality. Best of all, each doll purchased helps feed children! For every cuddle+kind doll sold they give 10 meals to children in need. Yeti, Set, Go! is a follow-up to PlayMonster’s Toy of the Year award-winning game, Yeti in My Spaghetti®, taking the mythical yeti theme to a whole new level! In the fast-paced all-play game players help four different Yetis – with four unique personalities – kick meatballs up a snowy mountain, trying to be the first to get theirs on the ledges. Massive Monster Mayhem is an action-packed, sci-fi action adventure game show starring the greatest Massive MonsterSuperstars in the Universe and they just launched a new toy line this past October. The toys bring kid’s imaginations to life through a variety of battle-inspired items, including a Massive 5-foot Moon Ball, outrageously huge Inflatable Bash Weapons, larger-than-life wearable Bash Armor and Power Punchers – everything kids need to safely step into action, battle giant alien monsters and save the world. The Orbeez Ultimate Soothing Spa is the perfect gift for a child who wants to have a “spa day” just like mommy! Newly redesigned with bright, lively and fun Orbeez colors, toe separators and nail polish, the Ultimate Soothing Spa comes with everything kids need for the pedicure of their dreams. Complete with 2,000 Orbeez, a cascading waterfall and a built-in strainer, well-deserved relaxation and fun is guaranteed. This is a great eco-friendly gift idea for little ones! Baby’s first organic book is soft and ready for story time. The book features high contrast patterns printed with natural inks on organic cotton. A solid beech wood bunny doubles as a teether and a play pal. In this entertaining and instructive book, mechanical engineer and educator Paul Long gives step-by-step instructions for making low-tech devices using everyday objects in inspired and ingenious ways. Create machines that flip a light switch, squeeze toothpaste, dispense candy, make music, and more. Each of the thirteen projects demonstrates how to build the machine’s various elements, and explains how they work together to make a mind-boggling mechanism that delivers hours of fun and fascination. Also included are interesting sidebars on the science behind each gadget, plus tips and tricks for success. Artsbot Activity Kits pack hours of creative energy into a small box that’s easy to bring on the go. Each kit contains all the materials needed to create several projects, plus a set of non-toxic markers, a mini sketch journal and pen, postcard and stickers. They also include a cotton drawstring activity bag to keep all the supplies in one handy place. Squishmallows are a collectible, plush toy line that has been dubbed the “softest” plush toy. From animals to fantasy creatures, more than 50 styles of these marshmellow-soft characters are available and make the perfect gifts and stocking stuffers. Parents have reported that hey are great for kiddos with anxiety and sensory sensitivities as well! Kids will love creating unique, moving structures while being introduced to important STEM skills and engineering principles through fun hands-on play. This 330 piece set includes a magnetic cannon, stop and go mechanism, magnetic transmission and Gravity Motor. 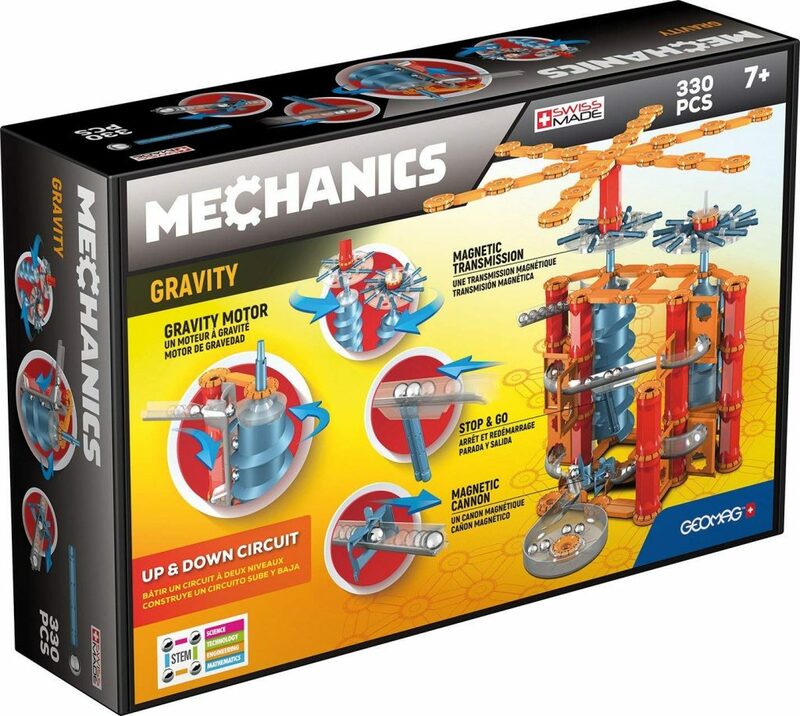 The system is made up of magnetic rods, steel spheres and elements of different shapes such as cylinders, bearings and modular parts so, when assembled correctly, kids can use the force of gravity to create chain reactions for never-ending fun. This beautifully designed, wooden toy set let’s young kids bring three animal friends for a ride on this stylish wooden Ferris wheel. Kids can turn the handle and watch this big wheel spin. They can use the included wooden bead abacus to count rides, ticket holders or the number of spins. Each playset includes a spinning wooden Ferris wheel with three carts and three solid beech wood animal friends. Strawbees is a simple concept of straws and connectors, but a limitless opportunity for kids, or inventors of any age really, to bring their building dreams to life! Kids can build and experiment right out of the box, creating the most amazing stories around the 105 included challenges. This kit will encourage them to develop problem-solving skills as they modify their creations to come up with new and different solutions to challenges. Kids get up-and-moving with Chrono Bomb® Night Vision. The Mission: Cross the Laser Field Before It’s Too Late. Kids turn off the lights for a thrilling nighttime mission (or the game can be played during the day with the lights on)! Using the clamps and 37-foot string to create a “laser” field to crawl through, kids wear UV light goggles to illuminate the string, and carefully make their way through the laser field. The game can be played over and over again, building new courses each time or trying to beat your time and master your favorite setup! Hudson is an adorable motion–activated rattle that responds to the way the baby shakes it. Lean the 4″ puppy’s green legs down to see him glow green; lean his red legs down and watch the spots glow red! Hudson’s textured legs are just right for teething babies, and the soft rattling sound will both entertain and stimulate the senses. What can a makeable monster do? They motor, inflate, wobble, drool, soar, and one of them can even do push-ups. Add a pair of wings, subtract a tentacle…the best thing about these monsters is that they’re part experiment, part imagination, and 100 percent customizable. Author Sam Haynor draws on his experience with the San Francisco Exploratorium, Oakland Toy Lab, Goldieblocks, and designing STEAM curriculum to create projects packed with features. While, on the outside, most appear to be built completely from common craft materials, they contain circuits, levers, projectile-launchers, puzzles, and much more. The projects are safe and fun for younger kids working with adults, and most of them can be tackled by middle-graders with minimal adult help. What gifts are you giving the kids in your life? Share your favorite gift ideas with me on social- Twitter, Instagram, and Facebook. These full-function remote control Cat machines are designed to bring the construction site to your backyard! Scoop up and load gravel, sand or loose dirt with motorized dump bed and shovel. Children get 4-6 official Disney Princess toys, activities and fashion accessories every two months with this subscription box. Learn more and order it here. Fin Fun’s Wild Things soft plush hooded animal blankets feature a comfortable design with hand pockets that easily wrap/cascade around the body. Special touches like animal ears, eyes, paws or flippers make these perfect for imaginative play. Styles are available in youth size only, and include: Snowcap Polar Bear, Snapper Turtle, Timber Brown Bear, Cinder Black Bear, and Roary Lion. Laura Ingalls lives in a snug little log cabin with her ma, her pa, her sisters, Mary and Carrie, and their dog Jack. Almanzo Wilder lives on a farm with his family and lots of animals. These pioneer children have all sorts of frontier adventures, including trips to town, county fairs, spring snowfalls, finding new friends on the prairie, cozy winter days, and holidays with family. This collection includes the following picture books: A LITTLE PRAIRIE HOUSE, GOING TO TOWN, COUNTY FAIR, SUGAR SNOW, WINTER DAYS IN THE BIG WOODS, and CHRISTMAS IN THE BIG WOODS. Turn still pictures into fun animations with Magic Scene Creator. To use, simply place any of the 70 included Motion Cards on the tablet screen and watch the cartoon drawings come to life. You can also make your own drawings and animate them using the Motion Cards .The Magic Scene Creator comes with six Gel FX Markers so you can draw directly on the screen or enhance the Motion Cards with your own embelishments–create your own car with wheels that appear to spin or draw a cool bird with wings that appear to flap! When it’s time for something new, simply wipe the screen and cards clean with a damp cloth. This fun coloring gift set is a wonderful way to experience the magic of animation. Despicable Me 3 is now available on Digital, 4K Ultra HD, Blu-ray™, DVD and On Demand December 5, 2017. The characters beloved by everyone – Gru, his wife Lucy, their three adorable daughters—Margo, Edith and Agnes—and the Minions provide hours of family fun in this heartwarming comedy. After he is fired from the Anti-Villain League for failing to take down Balthazar Bratt, the latest evil mastermind to threaten humanity, Gru finds himself in the midst of a major identity crisis. But when a mysterious stranger shows up to inform Gru that he has a long-lost twin brother — a brother who desperately wishes to follow in his twin’s despicable footsteps — the former super-villain rediscovers just how good it feels to be bad. Despicable Me 3 is the ultimate holiday gift, with almost an entire hour of exclusive bonus features including an all-new mini-movie, a never-before-released deleted scene, and much more! Attention dinosaur fanatics! This is a big, gift-worthy hardcover that is also the most complete and comprehensive dinosaur reference ever. Although these amazing creatures roamed the Earth ages ago, new dinosaur discoveries are still being made today. The new edition includes favorites, like the fierce T-rex and the gentle Brontosaurus, plus audacious new finds, like the Anzu, Kosmoceratops, and Yi. Every dino profile is colorfully illustrated and features descriptions of when they roamed the Earth, how they lived, what they ate, and more. There are more than 600 dinos featured in all, including 10 profiles of recently discovered dinosaurs and new entries in the Dino Dictionary. Reports from paleontologists present the latest news and insights from the field. With GET QURIOUS, children engage in creative play with story cards, sticker books, puzzles, masks, and more. Their play experiences can then be enhanced by playing with the Augmented Reality apps. Once downloaded, the apps bring endless game and activity variations to the children’s play experiences while fostering their curiosity, discovery, and passion for STREAM – Science, Technology, Reading, Engineering, Art, and Math. Kids can enjoy these activities by themselves, or with others. Different boxes are available. The GET QURIOUS EXPLORER BOX and Augmented Reality app bring the adventures of Manu & his friends – Leo and Emma – to life as they blast off into space together. The fun experience of combining physical game pieces with an interactive world encourages curiosity and imaginative play. The EXPLORER BOX helps you create your own stories, build different spaceships and maneuver them within 3D space animations, record stories with four masks of your GET QURIOUS friends, and discover hidden artifacts in four brilliant 3D animated space worlds. Unique Hot Wheels vehicle styles with cool, characterized actions. Buttons unlock motorized drive action with ‘jaw chomping’, ‘spider crawling’ or ‘tail striking’ fun! Features exciting light effects, fun sounds and character themed music. There’s nothing like an erupting volcanic eruption to get your child fired up about science! Create your very own erupting volcano with this unique no assembly required model. Includes an easy-to-prepare lava recipe, a 13″ clear plastic tray and a removable tube that allows for quick clean up. Detailed cross-section shows the inside of the volcano. Includes a fact-filled Activity Guide, with all the information kids want to know about volcanoes. Stitch together 10 of the most popular princesses from the world of Disney animation! The 48-page instruction book has step-by-step instructions and color photos to help you bring these characters to life. Die-cut templates, felt, stuffing, embroidery floss, and a needle are all included so you can make Snow White, Belle, Cinderella, Ariel, and six other adorable felt princesses. These fun, collectible characters make great gifts for Disney fans of all ages! Rocketbook Color makes it easy to create, save and share our childrens’ masterpieces without wasting a single leaf of paper. Here’s how it works: kids draw in the Rocketbook Color notebook with Crayola Dry Erase, Washable or Silly Scents crayons and markers, parents tag finished drawings using icons at the bottom of the page, parents scan each page using the Rocketbook app, blasting drawings to each icon’s corresponding destination and then pages erase like magic with a damp cloth after drawings are sent to the cloud. Custom-designed vehicles with high-impact speaker-pulsing action! Features great music, realistic vehicle sounds and flashing lights. This subscription box offers surprises each month with a mission to rescue an endangered animal in a new part of the world. Box includes curated activities and accessories to complete the adventure. Each box provides 5-10 hours of learning, creativity and pure fun! Learn more and get it here. King Jasper loves being king. Ruling over his small kingdom, he spends his days reading, coloring, and playing with his dog, Greg. Life in the castle couldn’t get any better! Or could it? With a wizard who can conjure anything Jasper wants—dragons, robots, superheroes, even rainbow-colored kittens—the young king creates a magical mess only he can clean up. A hilarious, modern fairy tale about the dangers of overconsumption, The King of Too Many Things will keep kids guessing with the turn of every page, while showing how always wanting MORE can ultimately lead to LESS happiness. And, if you are already looking to get ideas for spring and summer birthdays….you’ll want to check out Rocking Monsters! Rocking Monsters launched on Kickstarter recently with planned production in January and delivery starting in March (for early backers). Rocking Monsters are a unique series of outstanding wooden rocking toys for little kids to get endless fun. Created by professional graphic designer every Rocking Monster is ergonomic, safe, and extremely entertaining. Learn more and back their Kickstarter campaign here. What gifts would the kids in your life love to receive? 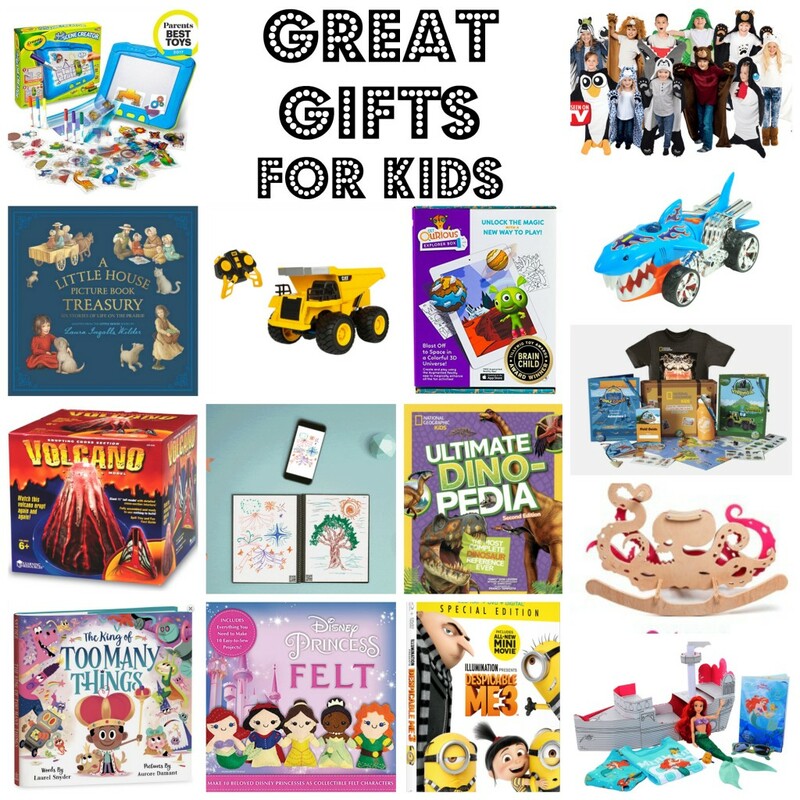 Find more gift ideas for kids below!